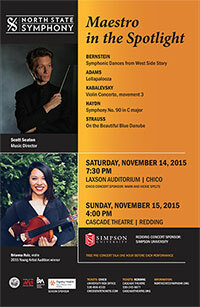 REDDING, Calif. - Simpson University is proud to be a sponsor of the North State Symphony’s “Maestro in the Spotlight” concerts on Nov. 14 and 15 in Chico and Redding. New symphony music director Scott Seaton will lead the program, which features Leonard Bernstein’s “Symphonic Dances” from “West Side Story,” and works by Joseph Haydn and Johann Strauss, among others. Redding violinist Brianna Ruiz, winner of the symphony’s 2015 Young Artist Audition Award, will play the third movement of the “Violin Concerto” by Dimitri Kabalevsky. Simpson University music professor Dwayne Corbin conducted four concert rotations over the past two seasons while the board searched for a new director. He continues as resident conductor and will direct the symphony’s youth concerts in Redding, Chico and Red Bluff in January. The Nov. 14 concert is at 7:30 p.m. at Laxson Auditorium in Chico. The Nov. 15 performance is at 4 p.m. at the Cascade Theatre in Redding. A free pre-concert talk takes place an hour before each performance. Tickets can be purchased at the Chico University and Cascade Theatre box offices or online at chicostatetickets.com and cascadetheatre.org. For more information about the North State Symphony, visit northstatesymphony.org.